Johnson seems to race with Lady Luck riding shotgun. Last Sunday at California was a perfect example. A caution came out just as Johnson entered pit road. 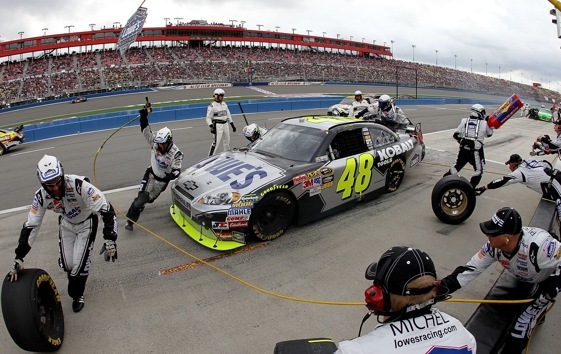 It couldn’t have been timed more perfectly if crew chief Chad Knaus had waved it himself. I won’t say that opportune caution/pit stop won the race for Jimmie but it certainly didn’t hurt. It’s happened time after time in recent years. Sometimes it seems that the racing gods are wearing Lowe’s t-shirts and No. 48 caps. And before the bloggers blow an fuse on their computer, I’m not suggesting that Johnson lucked his way into any of his record four consecutive championships. I’m just saying that Jimmie’s football has taken a lot of fortuitous bounces. There’s no denying that over the last four years Johnson been a dominant driver with a dominant team. He has earned each of those big shiny trophies. But there’s also no denying he’s also had some fortune along the way. I believe that in most cases, athletes and sports teams make their own luck. I don’t think its coincidence that the better a team is, the luckier it seems to be. Johnson, for example, generally manages to put himself in a position to take advantage of a lucky break when one comes along. If he’d been running dead last Sunday at California, for example, no number of free pit stops would have helped him win. A lot of credit goes to Knaus. He’s a pit road maestro who plots sound strategy and coaches his driver away from trouble. I guess you could say that Jimmie’s lucky to have Chad. You could also say that boss Rick Hendrick is lucky to have them both. But remember, neither Johnson nor Knaus were particularly hot commodities when the landed at Hendrick Racing. It wasn’t luck on Hendrick’s part, getting such a record-setting duo, but rather his talent for spotting talent. They say it’s better to be lucky than good, and when you’re both – as in Jimmie’s case – you’re darn near unbeatable. And so it is that Jimmie already has a win under his belt and is off to a strong start in his drive for five. I’ve learned my lesson; I’ll never bet against him. I didn’t think he could win two in a row, then never dreamed three was possible. Last year I would have been willing to bet my house against four. Thank my, uh, lucky stars, I didn’t. WWDD? What would Dale do? If someone had taken 4 straight championships in Earnhardt’s prime, the four time champion would need plenty of extra money for sheet metal, as they would get their cage rattled, hard, every week. Do we have to wait for Danica to get to Cup racing before someone man’s up and consistently puts a bumper to the 48? If you can’t beat ’em, bang ’em. Stock cars have fenders and bumpers for more reason than decoration. or at least have them pick my lottery numbers. HMS took a chance with that hire and it worked .